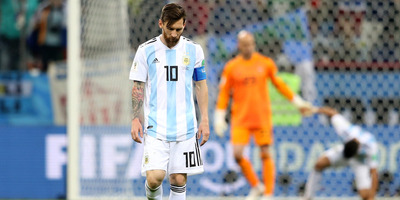 Gabriel Rossi/Getty ImagesA dejected Leo Messi after Argentina suffered a devastating loss against Croatia in the group stage of the 2018 World Cup. The one big criticism of Leo Messi as a footballer is that he has not had the same success with Argentina that he has had at Barcelona. But even Argentina’s coach, following another disappointing international result for Argentina, has admitted that the team is not built to showcase Messi’s incredible talent. If there is one criticism to be made of Lionel Messi’s extraordinary career as a soccer player, it is that he has led Argentina to a major international trophy. And with Argentina stuck with only one point with one match left in the World Cup group stage, that criticism looks likely only to intensify. In the post-match press conference, none other than Argentina coach Jorge Sampaoli said that the failings of Messi at the international level have more to do with what Argentina puts around Messi than Messi himself. “I think that because of the reality of the Argentine squad, it sort of clouds Leo’s brilliance,” Sampaoli said through a translator. “Leo is limited because the team doesn’t gel ideally with him as it should,” he went on to say, before adding that it was his responsibility as a coach to address this. Sampaoli gave this comment in response to a question about Cristiano Ronaldo, who has been subtly proclaiming his status as the “Greatest Of All Time” throughout what has been an admittedly incredible World Cup on his part so far. As for Messi, whose 31st birthday is just days away, this will likely be the last World Cup of his prime, meaning that he could very well end his career without ever winning the biggest prize in World Cup soccer, something his detractors will never forget. But there are still plenty of others who believe his legacy is intact, World Cup win or not.